The Genie Superlift Advantage is a manually operated material lift with multiple base and load handling options to create just the lift you need. The compact, portable design rolls through standard single doorways and loads easily into a ute. 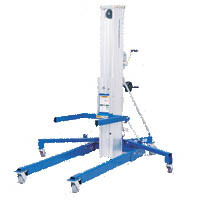 It lifts up to 454kg of material up to 3.49m and up to 295kg to height of up to 7.94m. With so many choices, the versatile Genie Superlift Advantage helps to maximise productivity and value for your money.